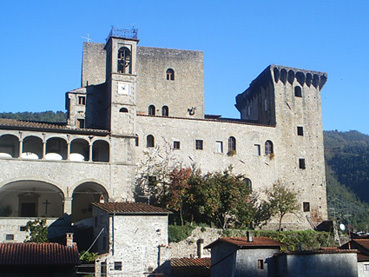 We may be a little bit biased but we think Gragnola is the best of all the Lunigiana villages :-) We are at the mouth of the Valle del Lucido and over looked by the Castel dell'Aquila. For a small village we are very well served. We have 2 pizzeria's (Pizzeria Tissi and Pizzeria Mulin), so no matter what night of the week you need never go hungry. We also have two bars (Bar Miro and Bar Settimo) so you will not die of thirst either. For your general shopping there are two mini-markets as well as a greengrocer and butcher. There is a bank in the village with a ATM. 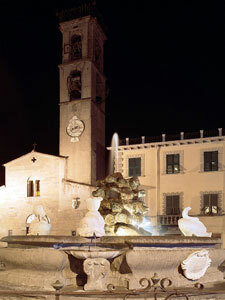 In the main square in Gragnola we have our Train Station, on the line between Aulla and Pisa. From here you can get to Cinque Terre and the coast, Lucca, Garfagnana and further afield. This is a regional line, so there is no ticket office and tickets must be purchased from Bar Settimo. 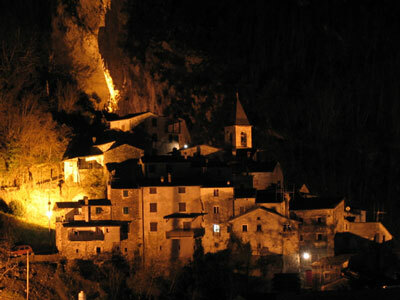 Equi Terme is at the end of the Valle del Lucido. Equi is a thermal spa village - offering a variety of health and beauty treatments. As well as the spa, Equi is also famous for its natural caves. The Grotto di Equi is open to the public from July to September (October to April only by appointment). There are a number of restaurants in Equi. Da Felice, La Posta and ristorante Fonte in the Hotel Equi Terme. Every year at Christmas the medieval village of Equi comes alive with the Presepe Vivente, the centrepiece of which is a live crib. 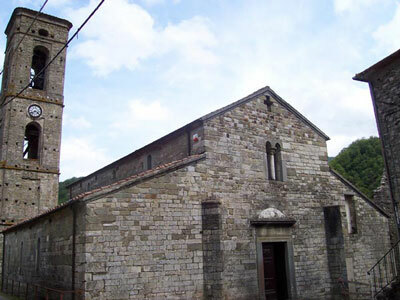 Important monuments to see in Casola in Lunigiana are the Pieve di Codiponte (Parish Church of Codiponte), the Chiesa di Santa Margherita (Saint Margherita Church), the Parrocchiale di Santa Felicita (Saint Felicia Parish) and the "Museo del Territorio dell'Alta Valle Aulella" (Museum of the Territory of the High Valley of the Aulella river). Among the numerous celebrations periodically taking place in Casola in Lunigiana we recommend the traditional "Festa di Pomi" ('Pomi' is local dialect for apples), held in early September. During which a market takes place where it is possible both to admire antiques and to taste good typical specialties cooked according to local traditional recipes. 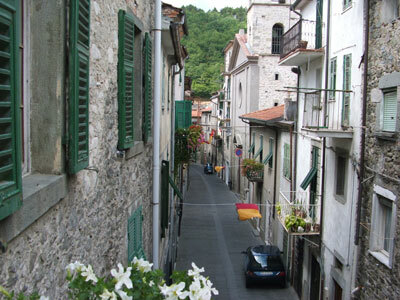 Fivizzano is often referred to as the Florence of Lunigiana. The first weekend of June brings the Sapori. This is the showcase for all our locally produced specialties. Here you'll discover cheese, salami, bread, honey, wine, etc... which has been produced in the Lunigiana area. All of the produce is of the highest quality and some of it is unique to our area. You have the opportunity to try and buy from all the exhibitors. View more on the next Sapori here. Fivizzano was printing books nine years before London. The typewriter was invented by Agostino Fantoni here in 1802. The Museo della stampa ‘Jacopo da Fivizzano’ is based in a 17th century palazzo and covers both of these events and other local interests. The castle of Verrucola de' Bosi (Verrucola Bosorum) was documented for the first time in 1044. Before the age of the Malaspina family it was an important stronghold of the Lunigiana, dominated by the Bosi. 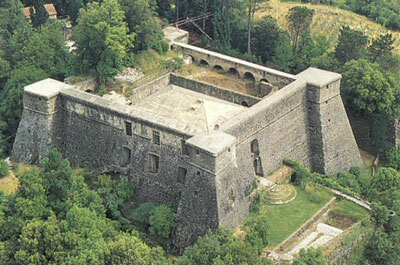 During the 14th century within the mighty stone walls of this castle, Spinetta the Great, Marquis of the house of Malaspina, dreamt of conquering and unifying Lunigiana in order to build up his dominion. This attempt failed when Castruccio Castracani of the Alteminelli, Lord of the powerful city of Lucca, crossed the way of Spinetta and fought him in an epic battle. 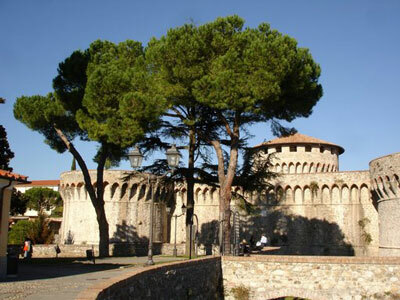 The Verrucola castle with its square keep, ancient and original part of the fortification, its great tower still endowed with the stone brackets of the machicolation apparatus, the walled curtain, towers, bastions and the medieval suburb born at its feet, with the medieval bridge and two gates, is today one of the best preserved examples in Lunigiana, due to a great work of restoration undertaken in the recent years. It is a private property, usually visible only from the outside. In summer is partially open to the public on Friday mornings. Literally translated, "Pontremoli" means "Trembling Bridge" (from the Italian "tremare" - "to tremble"), with the commune having been named after a prominent bridge across the Magra. 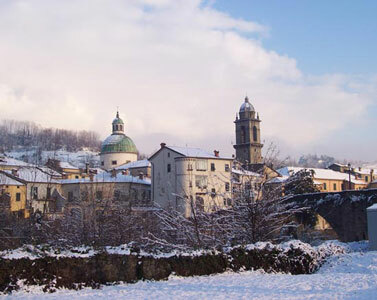 A large number of churches are situated in Pontremoli and these provide the main cultural sights of the city. One of these is the Church of San Nicolò which houses a wooden cross, dating back several centuries. Also present is the Chiesa Cattedrale S. Maria Assunta (Il Duomo) which was built in the 17th century and dedicated to Saint Geminianus - the cathedral holds many valuable sculptures and paintings. The dome of this cathedral, along with Il Campanone (the bell tower), dominates the city skyline. The church of the SS. Annunziata with its Augustinian monastery and painted mural is another notable feature within the area. 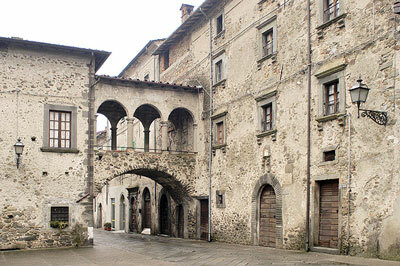 There are also several buildings concerned with the past noble families of Pontremoli. 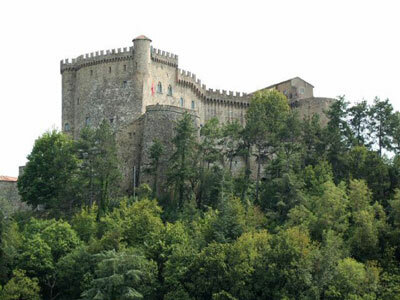 The major site is the Castello del Piagnaro, one of the largest castles of Lunigiana. Several palaces, such as those of the houses of Malaspina and Dosi, are located within the commune. Traces of Roman and Etruscan civilizations found in the Church of Saint Caprisio indicate that there were settlements in Aulla long before the eighth century, when Adalberto of Tuscany founded a village and castle to accommodate pilgrims traveling the Francigena route. Dominating Aulla is the Fortezza della Brunella (Fortress of Brunella), bought in the early 20th century by Lina Watterfield. It is now privately owned, functioning as a museum of natural history for the Lunigiana region. Aulla is the exit from the A15 motorway for most of Lunigiana. In 1943 the historic center of Aulla was destroyed by Anglo-American bombings aimed at German troops stationed there during the second world war. It is now however one of the fastest growing Italian cities. With its 12th century walls still intact, Fosdinovo Castle crowns a hill 550 meters high. The castle still dominates a great part of the Thyrrenian coastline. During the Middle Age its position was ideal to maintain control of the Apennines outlet to the sea and the Lunigiana region, with its roads and mountain pass linking the Thyrrenian coast to northern Italy. The castle is still in the Malaspina family today and has been renovated and restored to retain its historic and educational value as an ancient feudal residence. The position of Sarzana at the entrance to the valley of the Magra (ancient Macra), the boundary between Etruria and Liguria in Roman times, gave it military importance in the Middle Ages. The city itself offers a lovely 'centro storico' (historic city centre) still partly located within the ancient city walls and delimited by two main doors: Porta Romana (XVIII century) to the East, historical entrance to the city, near the massive "Testaforte Tower" and completely built in white marble, and Porta Parma to the west. Sarzana is full of charming squares, narrow streets, cafes, churches and monuments, as well as craftsman shops, bookshops and, above all, antique shops. A street market is held in the historic centre every Thursday and an antique market the first Sunday of each month. 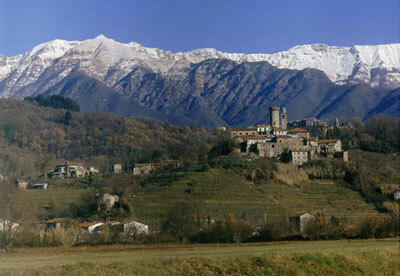 Cerreto is on the border of Tuscany and Reggio Emilla in the Alpi Appennino. 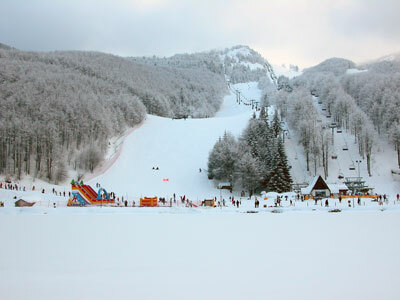 It is the nearest Ski Resort to Gragnola, approximatley 30 minutes away. Click here for a link to a tourism website of the resort. Cerreto also boasts an Olympic size Ice Skating Rink which is open all year around, details for the rink here. Here is a Link to a WebCam at Cerreto. Cerreto is not just for skiing - the lifts are also open in the Summer. Click here for more info. When you arrive in Villafranca, you can see the ruins of the castle of Corrado l’Antico and the antique shops of the village. There is an ethnographic museum located in an ancient windmill dating from the 15th century hugging the city walls. More information on the museum here and here. vulputate velit esse molestie consequat, vel illum dolore eu feugiat nulla facilisis at vero eros et accumsan et iusto odio dignissim qui blandit praesent luptatum zzril delenit augue duis dolore te feugait nulla facilisi. Filetto is famous for its 25th of August celebration for Saint Genesio. Its village is Byzantine and in July and August, there is a medieval market, with artisan shops, shows and historical commemorations. Near the village is the San Genesio oratory, in the mysterious woods of Filetto, where it is said prehistoric parties and tribal meetings took place and where numerous statues - stele were found. Ca'Lunae is a picture-perfect example of an authentic Italian wine producer. The old vineyard has been changed into a museum and visitor centre. The grounds have been landscaped into beautiful gardens and fit perfectly with the restored vineyard. Watch the production of local liquori. You can sample a selection of the Ca Lunae wines and products in the visitors shop. 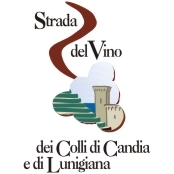 The Strada del Vino (dei Colli di Candia e di Lunigiana) is a wine route running through Luniginana and Massa Carrara. It showcases the local producers and wines of the area. Two examples of the region are the Candia dei Colli Apuani and Colli di Luni vintages, both of which hold the D.O.C. classification (Denominazione di Origine Controllata). The D.O.C. classification is a law established in Italy in 1963 concerning Italian bottled wines only. 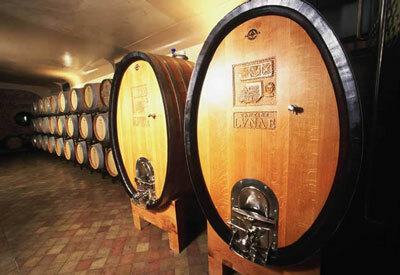 It determines the area within which certain wines may be produced, the soil and the arrangements of the vineyards; the grapes and blend of grapes; the method of cultivation; yield of the vineyard and method of vinification; and certain details like the length of maturation and whether wines of different vintages can be blended. 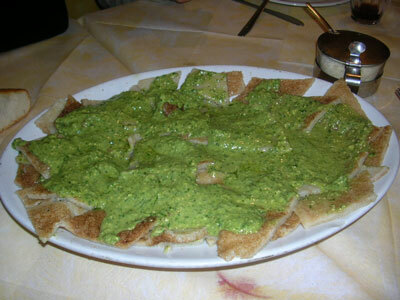 Testaroli are a specialty of the Lunigiana region. They derive their name from the testo, a flat or slightly domed cast iron or stone griddle that they're cooked on, and are quite ancient: The city of Pontremoli, Lunigiana's capital, levied a tax on testi in 1391 and reaffirmed it in 1564. More recently, some food historians have suggested that testaroli might actually be a forerunner of the pasta that's eaten throughout the rest of the Peninsula. If you can't wait until you get here to try it, why not follow this recipe. 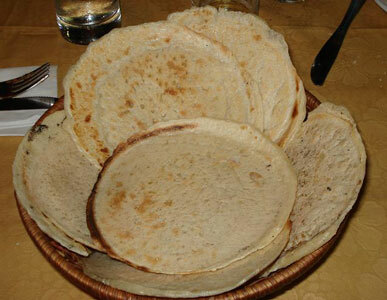 Panigacci are also a specialty of the Lunigiana area, especially Podenzana just outside Aulla. They are not made in testi but rather testine, which are flat, unglazed terra cotta saucers about 7 inches (18 cm) across: they put balls of dough on hot testine, and stack them. What emerges is flat, firm, and is called a panigaccio. if you return a freshly cooked panigaccio to the coals it will puff up beautifully, becoming a focaccetta. For a detailed description on how to make them click here. Lardo, literally translated as lard may not sound very appetising, but don't let that fool you! it is a cured lard that Colonnata's quarrymen have been using as sandwich meat for thousands of years. 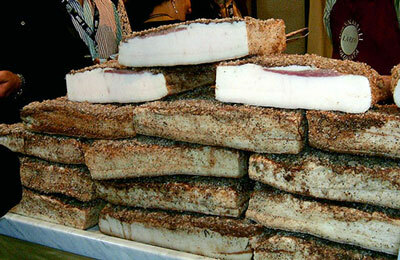 Lardo is traditionally served thinly sliced on warm toast, although it is now it is integrated in many Tuscan dishes. For more on this unique local specialty click here. 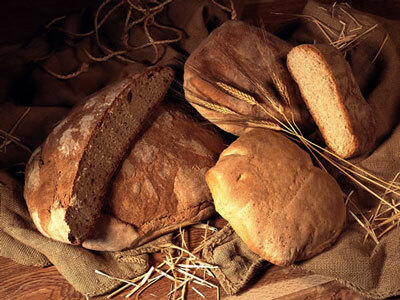 Vinca is renowned for its bread which is a dark colour and loaves are usually round. Each loaf weighs about 2.2kg. The dough is made from soft grain flour, bran, water, yeast and salt. After being divided into loaves they are left to raise for 12 hours and then cooked in a wood fired oven. Copyright ©2008, 2009 Palazzo Marmi. All rights reserved.